The Maxwell Render Calculator takes educated guesses for render progress with NextLimit’s Maxwell Render. Beta, no guarantees for anything. Windows and Linux werecompiled on Mac, so there shouldn’t be any virus in it at least. Put these date in Scene speed input: Enter either Maxwell’s benchmark value or the size, SL and render time of your test. 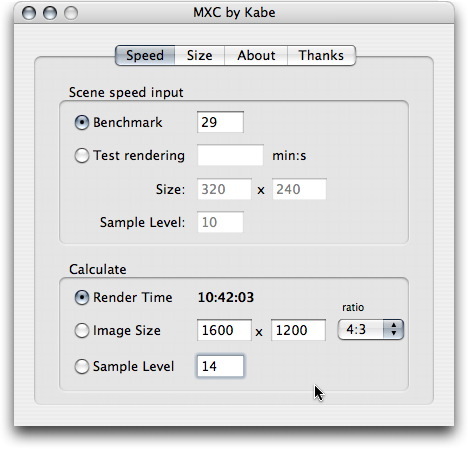 Please note: Speed input data are scene specific in Maxwell, so you need to benchmark each scene separately! Fill in the other values (i.e. Image Size and Sample Level you would like to reach. The result is displayed in real time. This is a no fuss application. No further installation. No DLL crap. No license agreement. No activation. No guarantees. Just like in the old days. All rights reserved. Do not redistribute. Do not sue me. Have fun! Very nice tool, but is this still valid with maxwell 2? AFAIK: Yes. If you find anything weird, just let me know!